If you’re looking for a bathroom installation in London, you’ve come to the right place. With the fast pace of modern life and work, more and more people are seeking the sanctuary and private space of a bathroom in which they can relax and enjoy. Bathrooms are complex, but help is at hand because Breslin Construction Ltd have skilled tradespeople who can do all the tricky work and meet the demands that each bespoke bathroom project requires. We offer bathroom design, renovations and make-overs. We are proud of our craftsmanship, providing fresh design solutions for each individual client. We can offer you practical advice in order for you to choose what it most suitable for your needs and budget. 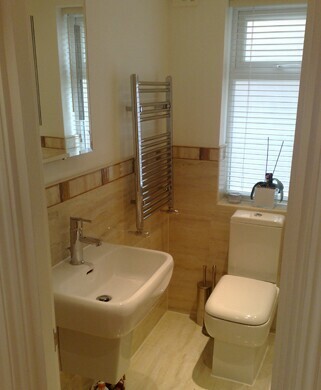 Contact Breslin Construction Ltd today to set up an initial consultation for your bathroom installation in London. Discuss bathroom design options with respect to layout, lighting, flooring, appliances, bathroom cabinets, fittings, and finishes. We always measure the space and pay attention to details in both function and design. We will agree on a schedule prior to the commencement of the project. You will get your new bathroom design fast, with high-quality service and within your budget. Our 30 years of experience stands at your disposal.